There are musical situations where you have to learn complex theory to understand what is going on. Some music can be understood (or written) only if you understand counterpoint, or serialism, or 4-parts harmony. Today we see a super-easy trick that has a lot of mileage and that everybody can use. In fact, if you can play a basic minor pentatonic scale, you will be able to apply this IMMEDIATELY. So what are we going to see? 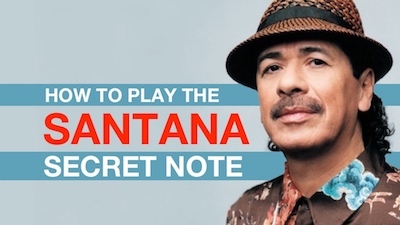 Well, are you familiar with Carlos Santana? (I assume you are) In many of his solo you can hear that warm, exotic vibe that has made his sound unique. Wether you are a fan or not, you know that his style is immediately recognizable. Well, believe it or not it's very easy to get that sound. You just need to add one note to your pentatonic scale. And the beauty of it is that that very same trick can be taken further and give an interesting, jazzy sound to your solos. As you can see, it does not get simpler than that. Write your own lick or feel free to transcribe the licks I use in the video. If you like this kind of simple theory, have a look at this course on pentatonic scales in which we cover more than just the simple major and minor pentatonic scale and we work on how to play them all over the fretboard and how to use them to follow chord progressions. This course works for Blues, but also for Rock, Pop, Jazz, and Metal.